Sunderland manager Carlton Fairweather was disappointed by their finishing as Sunday's draw with Birmingham saw them lose ground in the Women's Super League One title race. The Lady Black Cats came from behind to claim a 1-1 draw. But the result left the club three points behind leaders Chelsea and only two ahead of third-placed Manchester City, who have a game in hand. 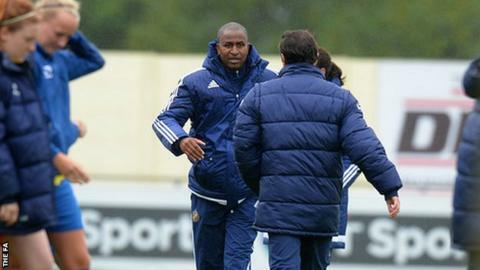 "I'm a little bit frustrated," Fairweather told BBC Sport. "It was just the finishing in the final third and if we'd got that right, we would have got the points." Despite the draw, Fairweather's side are still in contention for the title, and also have an eye on European football for finishing in the top two. "We've got three more games to go," he said. "We are where we are at the moment and it's one of these things where can we consistently keep gaining as many points as we can and then we'll see where that takes us."